73885A sleek stylish 4 light LED spotlight bar fin..
TR4801SISpot & Track - 1 Metre SilverThis 1 Metre ..
TR4801WHSpot & Track - 1 Metre WhiteThis 1 Metre W..
4109WHSpot & Track - Cylinder Head Painted Whi..
4109SISpot & Track - Cylinder Head Satin Silve..
1801SISpot & Track - Painted Silver Connector for ..
1801WHSpot & Track - Painted White Connector for T..
1802SISpot & Track - Silver 'l' Connector for the ..
1802WHSpot & Track - White 'l' Connector for the T..
5109WHSpot & Track Domed Head Painted White Tr..
5109SSSpot & Track Domed Head Satin Silver Tra..
7845-5Top Hat 5 Light Bar Spot Satin Silver Glass ..
G3222915The Torsion is an LED spotlight range that..
G3223015The Torsion is an LED spotlight range that..
6011-6CCTrack Spotlight - 6 X Led Head Suspension ..
5601-05-LED5 Light Led Cable Kit, Adjustable Gyros..
2724ASTrojan 4 Light Spotlight Split Bar, Antique ..
70411The Bullett kit comprises of 3 multi-directio..
70412The Bullett kit comprises of 3 multi-directio..
73686The Arezzo two bar has four adjustable spotli..
73689The Arezzo two bar has four adjustable spotli..
3TH113WThe Bullett is a multi directional mains tr..
48024The Bullett kit comprises of 3 multi directio..
48025The Bullett kit comprises of 3 multi directio..
3TH139WThe Conor is a multi directional mains trac..
61522The Cora is an adjustable track spotlight, wi..
3TRAW1MThis mains voltage track provides you with ..
3TRAWIThis mains voltage track provides you with e..
3TRAWISThis mains voltage track provides you with ..
3TRAWLThis mains voltage track provides you with e..
3TRAWPThis mains voltage track provides you with e.. If length is important for your needs then tracking lighting is what you need. Track lighting is becoming a trend with interior designers, modern shops and quality kitchens. They are elegant in design and movability, helping the user to move lighting around it's track with ease. 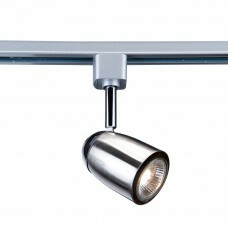 You can also grab a matching set of spotlights with most of our track range. Within this category there are two types of track lights. A "DIY" set; You will need to purchase the tracks, the joints and the lights separate, then fit the track and joints to your ceiling then finishing off by attaching the lights. The second is a pre-made bar which comes with a set of lights.